Dr. Donald Shoemaker (third from left), senior pastor of the Grace Brethren church in Seal Beach, California, is the recipient of the “Social Concerns Award” by the South Coast Interfaith Council in southern California. The award was presented at a benefit concert held at Temple Beth El in San Pedro, California, on Sunday, November 2. Shoemaker’s church was also recognized for its many social concerns activities and for encouraging its pastor’s social activism. 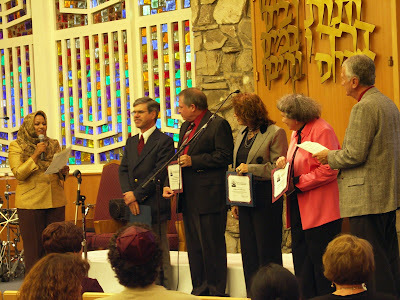 The award recognized Shoemaker’s leadership “in initiatives to ensure the protection of religious freedom for all.” Pastor Shoemaker authored a Religious Freedom Proclamation this year which encourages cities to uphold the principles of religious liberty and he sought the endorsement of many religious groups for his project. Shoemaker serves as chairman of the Social Concerns Committee in the Fellowship of Grace Brethren Churches and has pastored Grace Community Church in Seal Beach since 1984. His columns regularly appear in the local Long Beach newspaper.